Peel and stick wall decorations are one of the easiest ways to decorate your dorm room. 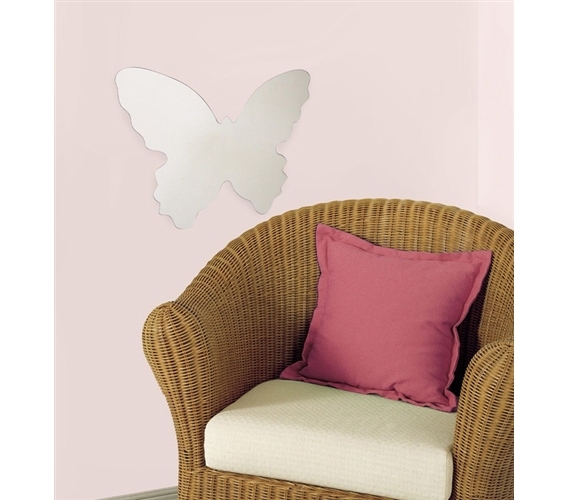 This mirrored butterfly wall sticker will bring a little bit of nature inside your college dorm room. The mirrored face of the sticker will reflect the colors of your college room and even allow you to check your hair before you head to class. Instead of worrying about all the rules that tell you what you can or can’t hang from the dorm walls, just peel and place this butterfly wall décor sticker anywhere you’d like for instant decoration. And when the school year is over, just peel this sticker from the dorm wall. Guaranteed to leave behind no scratches or marks! All college dorm rooms look the same at first, so make your room look girly and fun in seconds by decorating your walls with peel away dorm stickers. The best dorm decorations are the ones that effortlessly make your room the coolest and cutest place to hang out. Peel and stick decorations make excellent college gifts for girls who want a cute dorm room without all the hassle of hanging pictures or paintings. Wall stickers are the perfect form of room décor for college students who want to decorate their walls without damaging them.